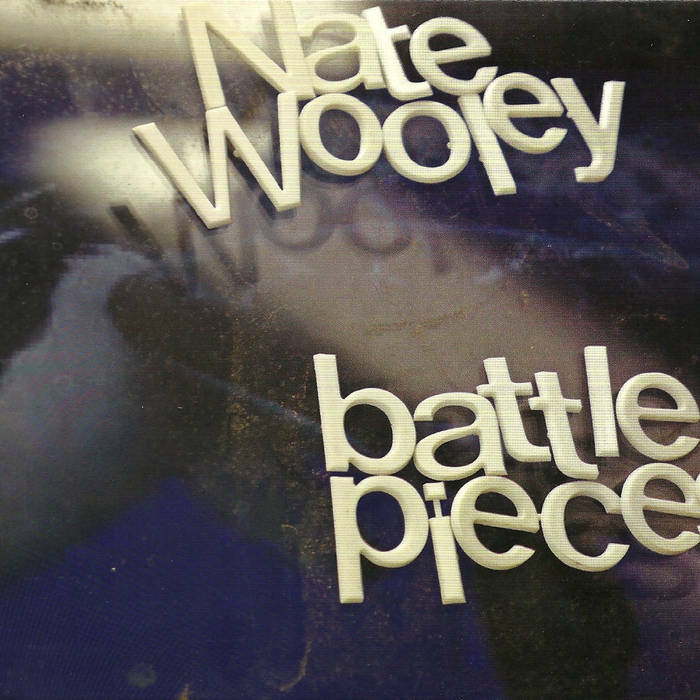 2017 is almost done (writing this review, you'll be reading it in 2018) and looking back I have to admit that Nate Wooley is one of the artists of the year for me. I discovered some of his back catalog this year for the first time, while also listening to new things like knknighgh on Clean Feed - every time I try to follow all the things he sings, talks and shouts with his trumpet. And I can't - which is amazing. And so, here is a new one: Battle Pieces II, on which, for the second time he colludes with Ingrid Laubrock on sax, Sylvie Courvoisier on piano and Matt Moran on vibraphone. A quick sidebar ... I have to admit that I love the vibraphone. While it might not fit in the context of this blog but I recommend to listen to everything you can find by The Dylan Group, a band that was centered around the vibraphone. So, from the moment Moran comes in, I am no longer listening objectively. I love the sound and within this quartet, it fits perfectly. Wooley starts of with a fine little melody in the first piece, then Moran comes along, and a few moments later Courvoisier adds some tones to it. It all starts very calm and relaxed. The four musicians take their time to start together. After three minutes already I've been taken into the music. I am tempted to stop writing (And I am not listening for the first time!) and close my eyes to just listen to what is going on - it is a lot. With four musicians in a room, on a stage (the album was recorded live in Cologne, Germany.) almost everything is possible. If I have it right, Wooley composes a lot of little pieces, melodies or patterns for the different instruments and every one can play one of these at any time. The 'rest' is up to the improvising capability of the four. So I repeat with this concept and four musicans on stage, everything is possible and almost everything happens: there is silence and noisy outbursts. There are single voices and all four play at the same time. There is sheer power and restrain. Having said all this I think I have to state my core impression of this album: it is lyrical and it is poetic. For me a good poem dances on the thin line of open sound and word-play on the one hand and understandable words or content on the other. A poem needs different layers, and this album is full of layers. There are lines, melodies and harmonies I can follow easily. But theses lines carry me to places I have never been and don't understand. Just to assure me a few minutes later that I am not alone in this place and the lines I recognized return in a different mode and so on. As it always is when writing about music, there is one sentence that comes to mind again and again: 'You should listen to it! You should listen to it to get what I mean. You should listen to it because it is worth every single minute.' Perhaps 'Battle Piece 5', the second track on the album, represents best what I am trying to say. It starts with a little line by Wooley, who is then joined by Moran on the vibraphone. As I said before. From that point on I am not objective anymore. I am hooked!! Then Laubrock adds her beautiful sound. This is the perfect example why I think this album is lyrical. The melodic voice moves from the one musician to the next and together they take me to places I haven't been before. Six minutes in, the sound gets wilder and more vibrant. Laubrock and Courvoisier build an intense dialogue in the middle of Part 5. Then Wooley takes over with a solo part. If you have heard him play already you'll know what I mean. But before I get lost in that uncharted territory a melody occurs and "takes my ears by the hand". A beautiful piece of music. 'Battle Piece 6' starts with Courvoisier's piano, however, the first two minutes the piano sounds like a guitar as Courvoisier works inside the piano. Moran joins after two minutes with some scattered notes. This all takes place in a very calm vibe. Though all the others eventually join in 'Battle Piece 6' stays calm and ends again with the piano sounding like a guitar, joined by Wooley with an aspirated pattern. I don't want to write about every piece in detail hoping that you start to listen to it on your own. P.s. : I don't know why such beautiful music is called 'Battle Pieces'. What I hear is a very respectful conversation and no battle at all. Is it exactly that? To contradict battle and all its ways? I checked the internet for a clue (as one does these days) and I found a book of poems on war by Herman Melville. Maybe that is a reference? I don't know. A nice appreciation. However, I have the first "Battle Pieces" album, which I found quite simply, a bore. I had looked forward to it with considerable appreciation, but it never came alive for me. In light of this second effort, I might have to go back to the earlier one and give it another listen. BTW, I do think it has some reference to Melville's poetic pieces. I recall having trouble with the first one as well. I eventually reviewed it here, but it took me a bit to get my thoughts together on it. I did like it, but it wasn't immediate. I'd be interested to read what you think after a fresh listen.